□ During the April 27th, 2011 Super Outbreak, a tornado of incredible ferocity left a streak of devastation through northeast Alabama. 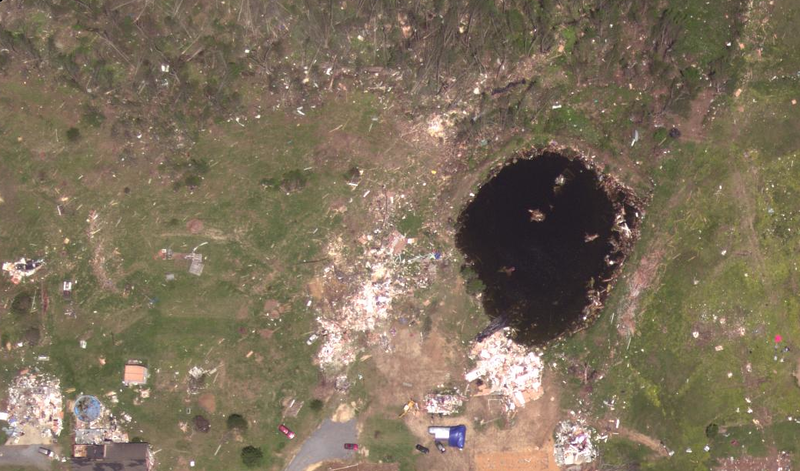 The tornado carved a modest 34 mile path, significantly shorter than many other tornadoes that day, but the intensity of the damage near the community of Rainsville was astounding. 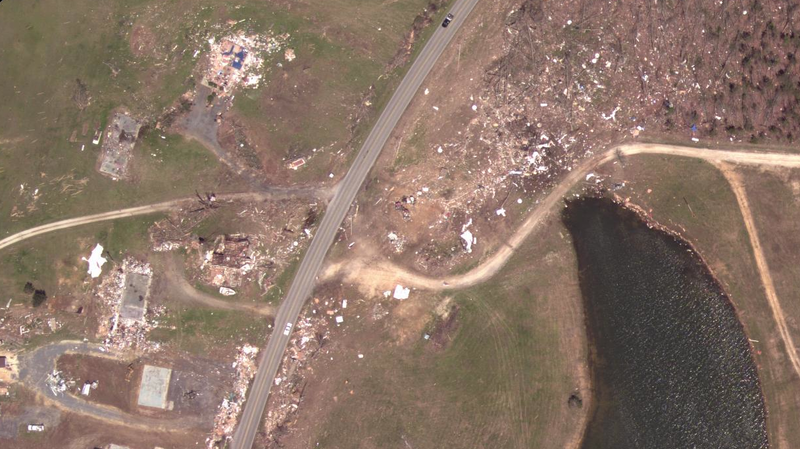 Some of the most powerful instances of tornado damage ever recorded occurred within a one mile long corridor along Lingerfelt Road, just east of central Rainsville. 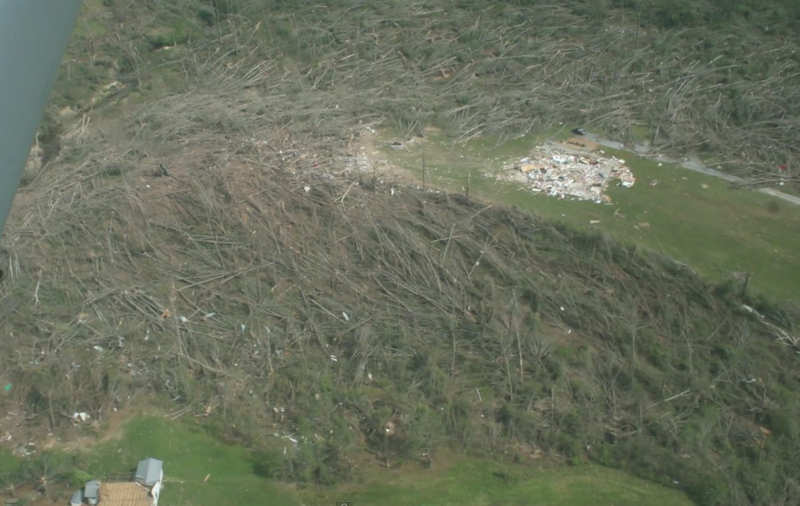 In DeKalb County, 25 people lost their lives and more than 200 homes were destroyed. 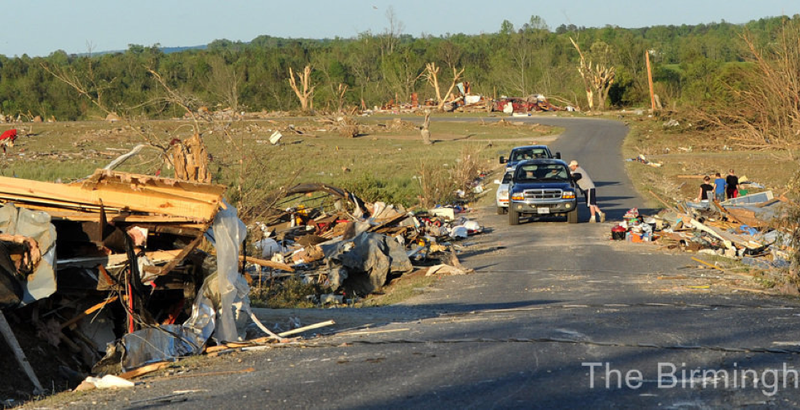 The EF5 tornado’s damage path was unusual and showed bizarre selectivity. Narrow bursts of extreme destruction were surrounded on all sides by damage of lesser intensity. In some cases, EF5 damage was found within 80ft of seemingly undisturbed trees. Visual documentation of the tornado indicates it had a complex multiple vortex structure. *Special thanks to the Robinson family for their photographs and personal stories. 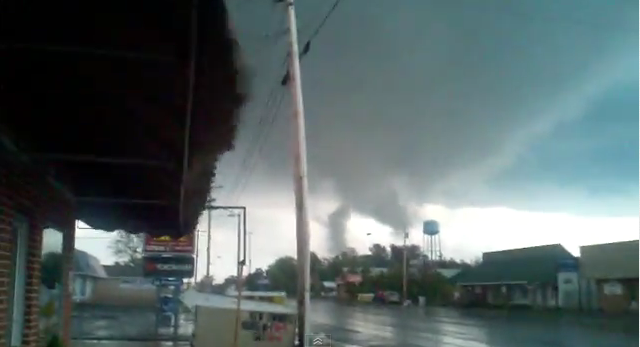 Nine miles after touchdown, the tornado entered a populated neighborhood in eastern Rainsville. The tornado’s first fatalities occurred in this area. According to an NWS contour map, the tornado was at EF5 strength as it crossed Main Street. The DeKalb County School Coliseum (large structure at right center) and adjacent homes only experienced moderate damage, however. Genuine EF5 damage commenced a half mile northeast of this area. A school bus was blown from the parking lot of the coliseum and stripped down to its metal chassis. Home damage nearby was of EF2 to EF3 intensity, but vehicle damage of this severity is rare and an indication incredibly violent winds were imbedded somewhere within the tornado. A cul-de-sac of large homes was swept away along Marshall Road. Extreme winds and high velocity debris left unusual gouge marks in a field downwind. 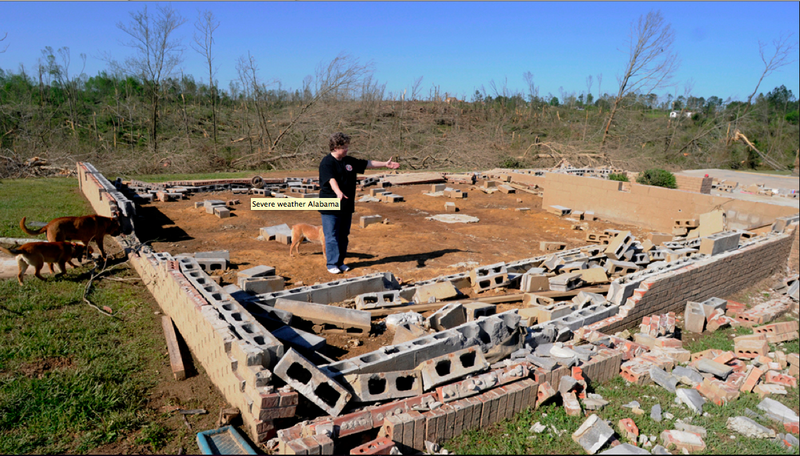 Damage in this area was approaching EF5 intensity. Before and after views of the devastated cul-de-sac. 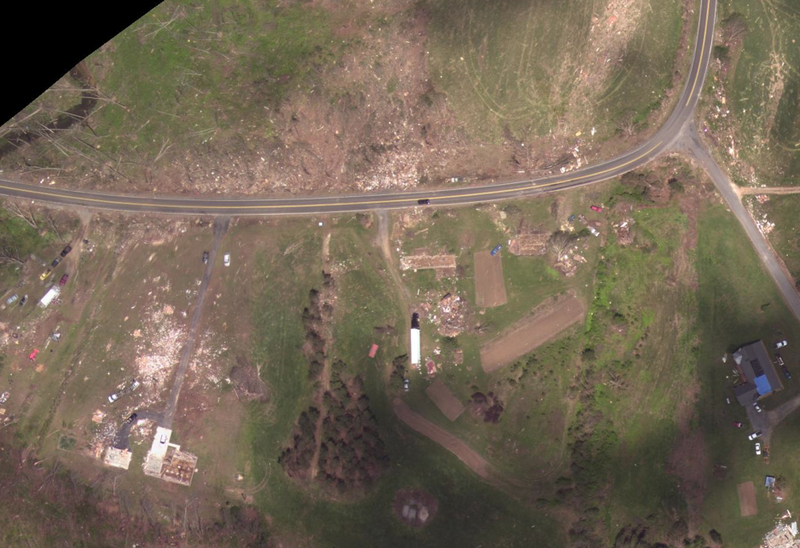 A stone home on Skaggs Road (top center) was swept completely away, resulting in one fatality and two serious injuries. The NWS survey team documented a section of the home’s foundation that was pulled from the ground. 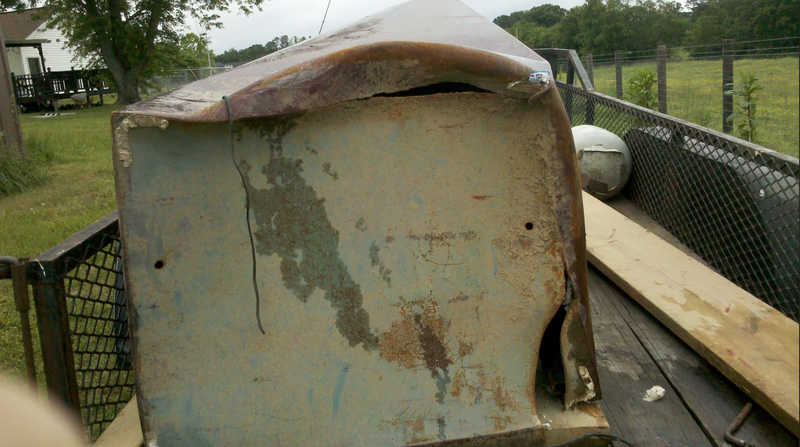 This likely occurred when a stone column anchored to the underlying concrete was torn away. Severe damage to a large, two-story home on Lingerfelt Road (incorrectly spelled “Lingerfeldt” in the NWS survey report). The position of fallen trees indicate a small scale vortex passed directly over the home before entering a wooded area to the northeast. Close aerial view of the home in the image above. Wide view of the Robinson home and surrounding areas. The strangely selective nature of the damage is apparent. Grass near the empty foundation was partially scoured away, yet trees 80ft to the east stand seemingly untouched. 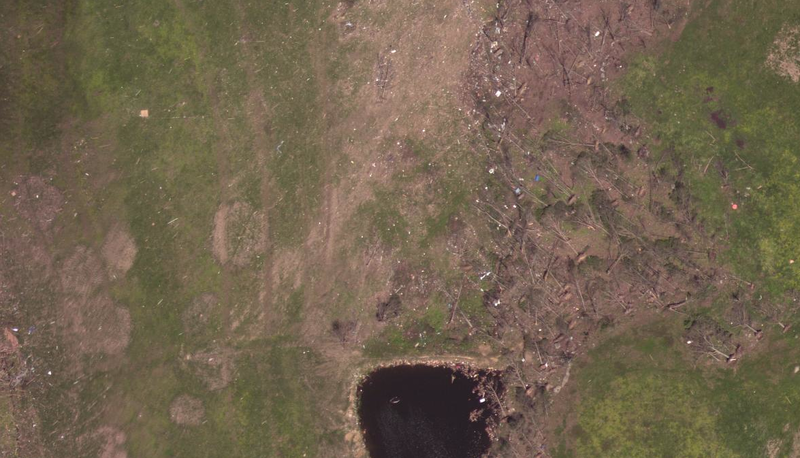 A truck that had been parked at the Robinson home was mangled beyond recognition and found 250 yards to the north (near the top edge of the image). Before view of the two large, two-story homes that were obliterated on Lingerfelt Road. The Robinson residence is at bottom left. Extreme tree damage to a tall, thick grove of pine trees on Crow Lane. The few remaining tree trunks have been stripped of bark and branches and snapped at ground level. Vegetation damage of this severity is likely an indication of EF5 winds. The NWS survey team described the damage in this neighborhood as “near EF5 in intensity.” Frame homes were swept completely away along County Road 441 and vehicles were thrown long distances and found wrapped around trees to the northeast. Additionally, the survey team documented streaks of ground scouring and sections of pavement that were removed from a sidewalk. 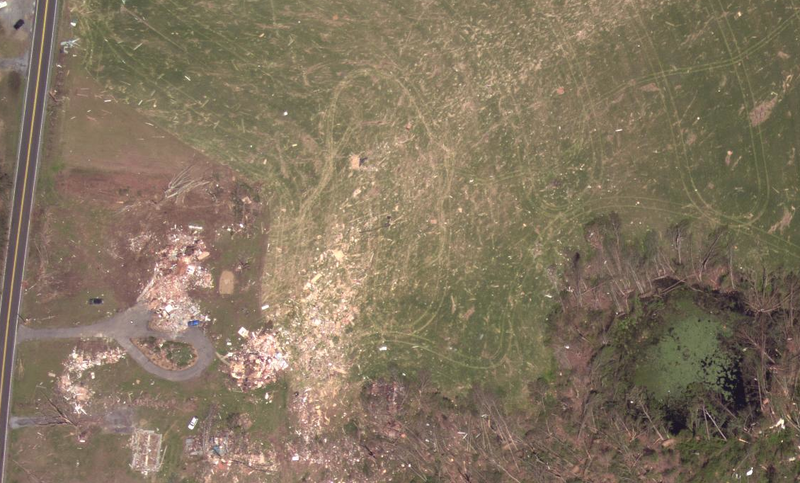 Before view of two homes that were swept completely away (visible in the lower left corner of the previous image). Bursts of extreme winds left pockets of scoured grass northeast of Rainsville. Homes and businesses were leveled and swept away along County Road 27. The tornado had expanded by the time it reached this area and was leaving a damage swath more than a half mile wide. Two large chicken houses were swept cleanly away near County Road 591. The tornado had weakened slightly as it entered this area, but was still causing pockets of near EF5 damage. More fatalities occurred farther north in neighborhoods to the east of Sylvania and Henagar, but no clear instances of EF5 damage were documented north of County Road 112. Because I here it mentioned much with this tornado, I am curious if you are aware of any photos of the 800 pound safe with the missing door. I can’t find any on NOAA’s website, so I was wondering if you knew of any links that did? Unfortunately, no I have not been able to find any pictures of the safe. I have tried contacting officials through the NWS website, but no luck yet. My name is colt Robinson I lived at the home listed above and it was our safe I still have images and don’t mind sharing. my husbands safe. I have photos. My guess is that NOAA meant to type “Liberty” instead of “liberty”, and I’m not sure if the company of Liberty is trying to hide the fact that one of their products failed or not, but I do believe that this could indeed be the 800 pound safe that was thrown 600 feet and had its door torn completely off. No John. That picture is not the safe at all. Extreme Panet has posted the correct picture above. How strong do you think the winds were at peak intensity? I imagine the main funnel had winds of nearly 200mph whereas fast-moving suction spots could have brought instantaneous gusts of over 280mph to small areas. I think all of the EF5’s on 4/27 had gusts over 275mph, and quite possibly over 300mph. Is it possible for a tornado to have sustained winds in the 250-300mph range; not just instantaneous gusts at those speeds, and if so, what are some tornadoes that may have had sustained winds around those ranges? I think that most tornadoes bring their most intense winds in brief gusts, hence the sharp damage contours separating lighter damage from complete devastation. 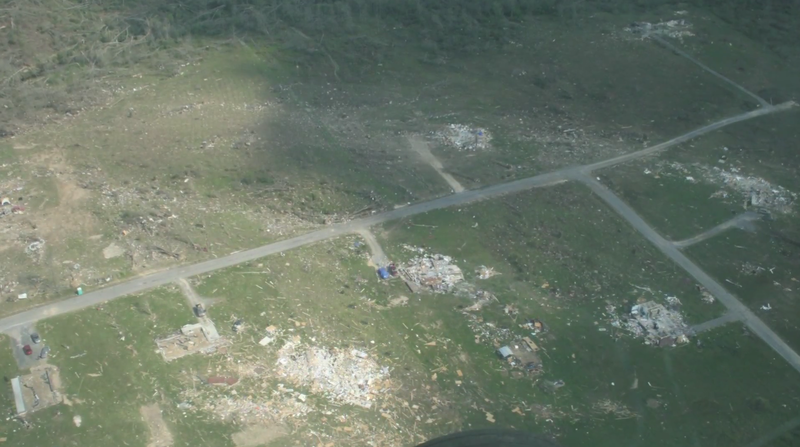 The Joplin tornado brought a wide area of EF3+ damage and moved fairly slowly, yet the Fastrip video clearly indicated the worst winds lasted only seconds. The only tornado I can think of that may have brought sustained winds in the EF5 range for a duration of more than 15 seconds is Jarrell. What tornado do you think (open question to others as well besides EP) brought the highest gust to the surface and how fast might it have been. I know you say the Kemper County tornado was some of the best evidence of winds over 300mph but which other ones ignoring wind duration. Smithville and Phil Campbell must have had some crazy surface winds. I think the highest winds in tornadoes with a fairly regular return rate (meaning it probably happens several times every decade) is certainly over 300mph at 10m, and probably somewhere between 320 and 340mph. This refers to only a one second gust as such winds would only last for a second at most. As the return rate decreases, the maximum possible winds get even higher. I don’t know how fast they can get, but I’m believe a gust over 350mph is possible. Tom Grazulis found winds of 300mph just above the surface using photogrammetry of the 1995 Pampa tornado. The Smithville and Philadelphia tornadoes caused much more intense ground scouring and were clipping along at 60 to 70mph, whereas the Pampa tornado moved at approximately 10mph, so I imagine they both had instantaneous gusts over 300mph. The Pampa tornado’s average speed was 16.4 mph. 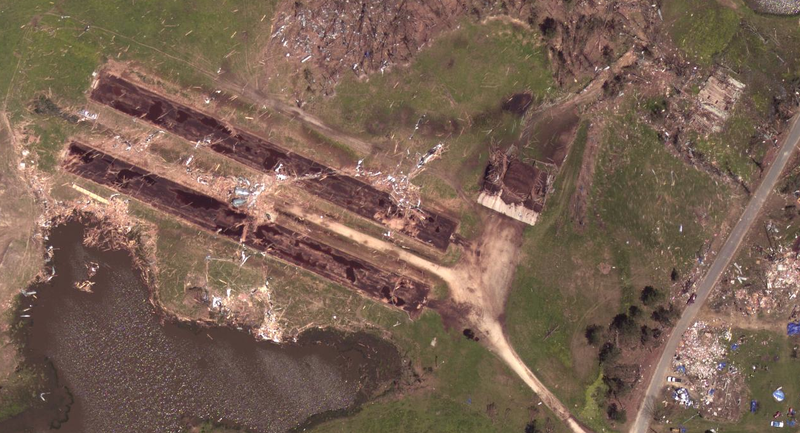 Using some very crude calculations, I estimated the average speed of the Pampa tornado in the actual industrial park (where it was doing the worst damage) to be highly variable, from about 12.7 mph in the beginning of its swath to 29.2 mph at max intensity. 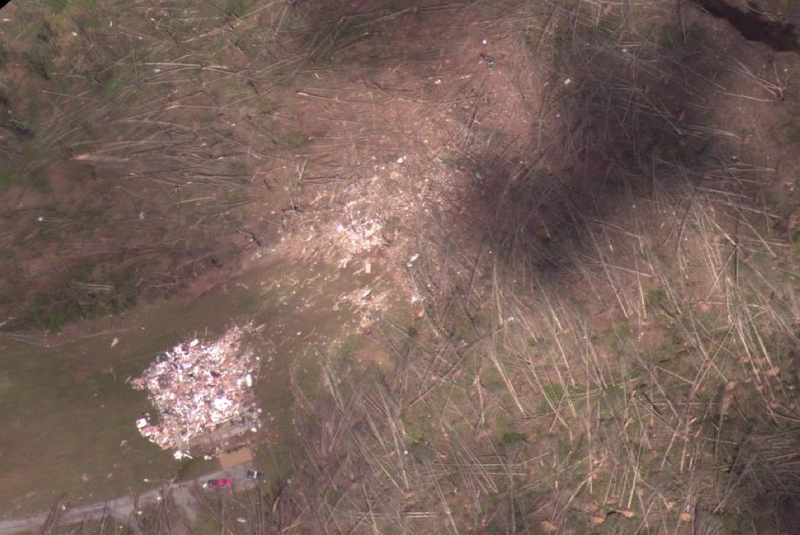 This is presuming a width of 50 yards at all times for the debris cloud, which seems to be more on the narrow end for the tornado’s width throughout its life span. do you know how long those 300mph winds in the pampa tornado lasted for? based on the videos it looks to be several seconds. Also wondering can the wind gusts you were discussing, 320mph and above, last well over a few seconds in a tornado? Would extreme damage occur just from a 1 second gust of 300mph? That seems too short to inflict a whole lot of damage. As for Pampa, do you mean the duration of peak winds as experienced on the ground? I would imagine for longer than most tornadoes due to the storm’s slow movement and symmetrical, single vortex nature. Some locations may have encountered winds over 250mph for 5 to 10 seconds or more on both sides of the funnel. Yes, extreme damage would occur from just one or two seconds of 300mph winds. 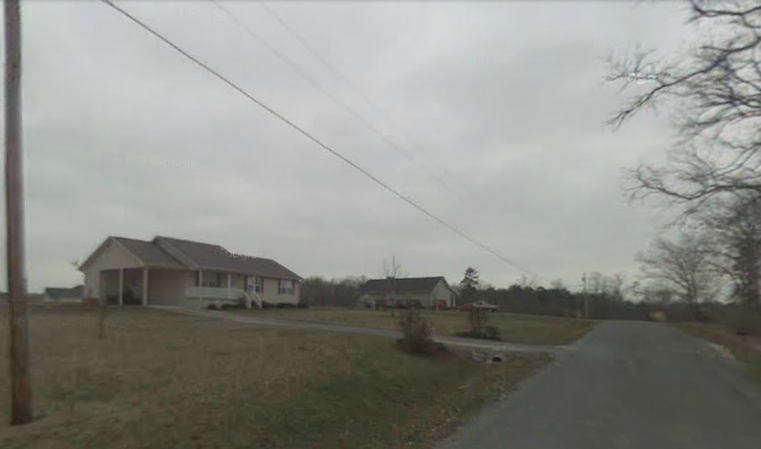 Houses probably “explode” and are swept away very quickly in the center of an EF5 tornado. The Smithville tornado is a good example. 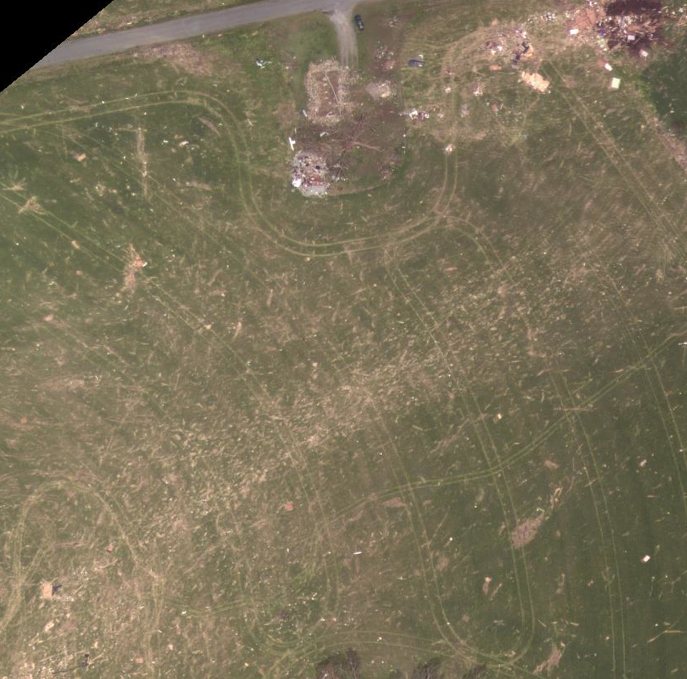 When you look closely at the damage photographs, you see the EF5/EF4 damage swath is generally less than 50 yards wide. Outside of that, the damage rapidly drops to a wide area of EF2 and EF1 damage. In some areas, the EF5 and EF1 damage contours are across the street from each other. Considering the tornado’s forward speed of 70mph, this means a single location in its path probably experienced winds over 60mph for 20 seconds, winds over 120mph for 10 seconds, and winds over 250mph for maybe two seconds. If it was graphed it would look like there was a giant spike in the middle, or maybe two spikes if it was a multivortex tornado. 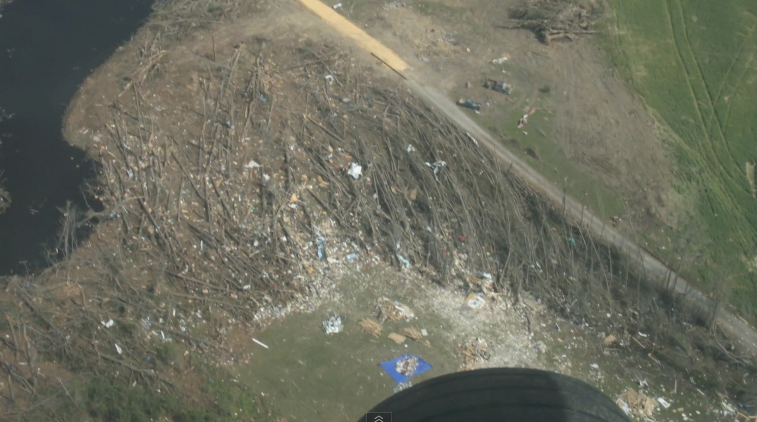 The Fast trip video from Joplin shows that extreme winds (EF3+) lasted maybe five seconds, ten at most. And that was in a large, slow moving tornado. 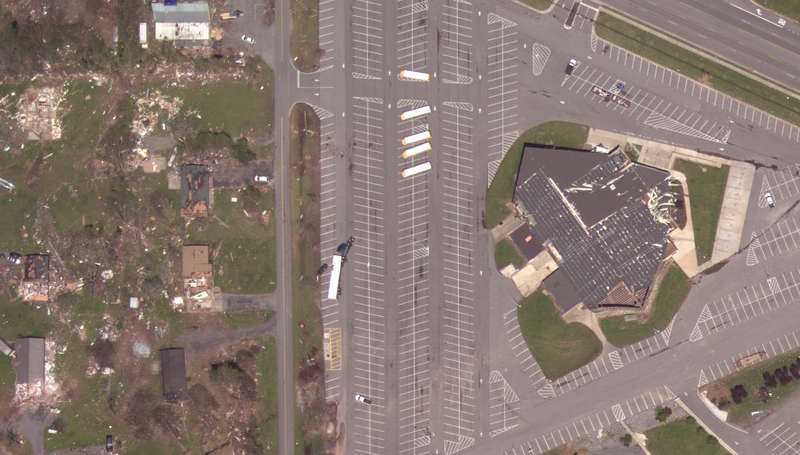 I see how you talk about the school bus and how it is nearby EF2/EF3 damaged structures. You believe that an incredibly violent wind imbedded in the tornado got a hold of the school bus. 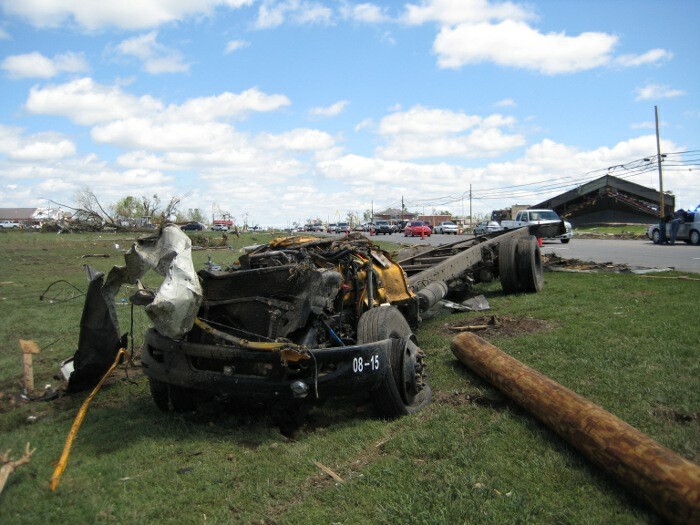 Here is damage photos from an EF3 tornado that happened on March 28, 2009 in Corydon, Kentucky. I very much agree with the EF3 rating based on the structural damage and tree damage etc. While I know this was not a school bus there is a ford ranger truck that was thrown 1/4 of a mile and mangled beyond recognition. Is it possible in this case scenario that a much more violent winds got a hold of the truck because the damage done to it is unbelievable. Here is the photos. I think it is the very first photo. http://www.webcitation.org/5ffkvZoTt. I know ford rangers weigh a lot less than school buses but still very impressive. Now that I looked a little more closely of the picture of the ford ranger truck I wonder if the tree fell on it and may have contributed to why it looks the way it did. I just checked out the link and yeah, it’s hard to tell how damaged the truck is because it’s flipped upside down. But the distance it travelled is pretty incredible. A school bus might be even easier to move than a truck due to its overall density, but it would also be heavier. The damage to that school bus in Rainsville is the worst I’ve ever seen – probably an indication that a narrow burst of EF4 winds swept across the coliseum parking lot. The vortices with EF5 winds commenced a little farther to the north. thank you for clearing that up. I had no idea that just a second of 300mph winds could do such destruction. Do you know what type of damage could be caused from 300mph winds lasting over 10 seconds? If you watch the videos of the homes that were filmed within close proximity of the earliest nuclear bomb test then you see exactly what happens to buildings impacted by a momentary wind gust over 200mph. The structural damage to many of those homes was less intense than that caused by some EF5 tornadoes. If winds of 300mph lasted more than 10 seconds than I imagine it would look like Jarrell – clean foundations, severe vegetation scouring and the removal of all pavement. Jarrell caused the most intense tornado damage ever photographed. 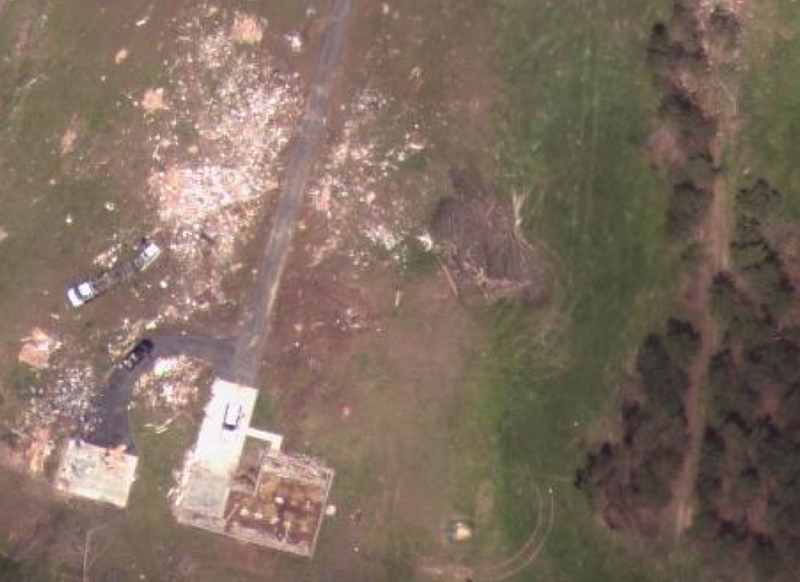 The 2007 Elie tornado probably brought winds of 250mph or so (photogrammetry would surely indicate this just above the surface) to certain locations for more than 10 or 15 seconds and yet the damage photographs show the grass wasn’t scoured. That makes me appreciate the damage in Jarrell even more. What kind of effect would a tornado have on a massive boulder; like the ones that lay on certain beaches or up on mountains? Would they be violently eroded or even picked up possibly? Same with hitting a rocky cliff? Of course its a rare scenario but would it just cross and travel up over a cliff or tear into it? Extremely violent tornadoes could move big boulders on the order of 10,000lbs+ if they were loosely fitted into the ground, but generally I imagine they would be mostly untouched. As for cliffs, tornadoes have impacted cliffs and they look much the same as they did before the tornado sans damage to trees and vegetation. 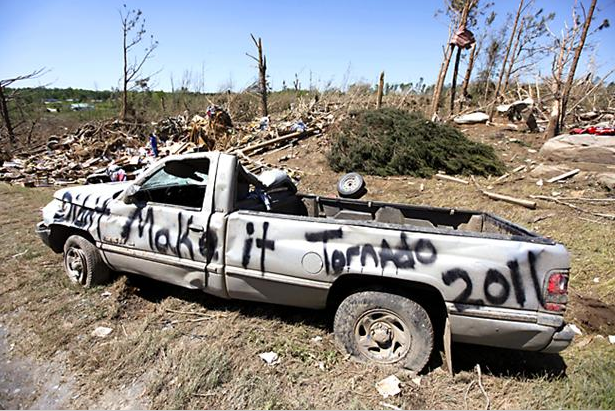 how fast are large objects thrown about in violent tornadoes? I would assume objects like 2 X 4s are flying at over 250 mph at given times but what about cars and other large objects? could they be accelerating at over 200mph if caught in a violent vortice? My guess is that cars and other large objects are not thrown as quickly as lighter debris, but still may reach speeds at or just over 100mph. The trucks hurled from the 1995 Pampa tornado were said to have been travelling about 90mph as they exited the funnel, meaning they reached incredible speeds rotating within a funnel only 70 yards wide. Speaking of which, how fast do you think that house was moving in the Elie tornado? can large objects travel much faster than 100mph in larger funnels with violent winds? 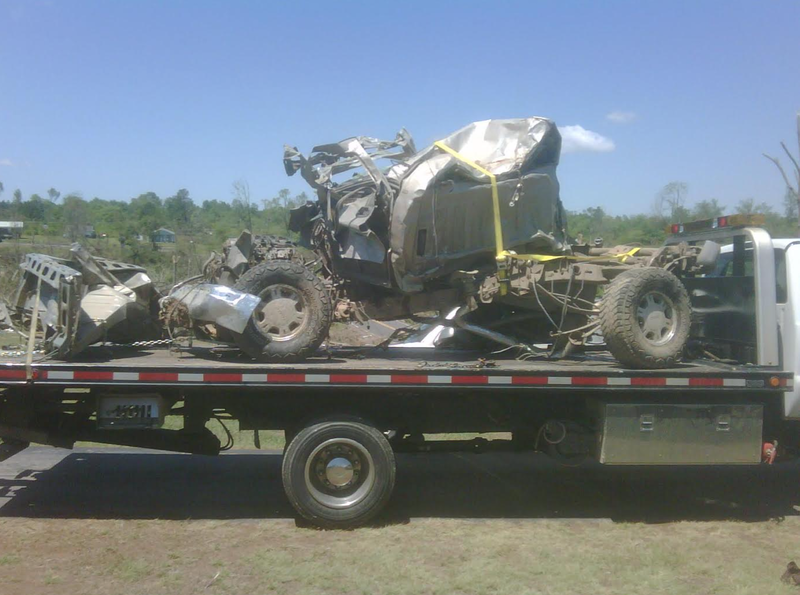 I do not know how fast heavy objects like vehicles can travel in violent tornadoes. But if the Pampa tornado caused two trucks to accelerate to 90mph, a tornado with an unusually large expanse of EF5 winds (like Jarrell) might cause a vehicle to travel at, I’m just guessing, 120mph briefly. Also, if a vehicle were centrifuged out of a tornado at a height of 400ft (which is very possible), it would hit the ground at over 100mph. Colt – your old home is quite famous in the meteorology community. I would love to see some of your photos and hear your story. My e-mail is extremeplanetmax@gmail.com, or I can contact you if you give me your e-mail. I just wanted to let you know that in the photos and information above, you mention that the first fatalities reported with this storm were in Rainsville. However, the first fatality was just south of Fyffe, about two miles after the tornado touched down. Her name was Eula Miller.